MORGANTOWN, W.Va. – Holding Kansas scoreless over the final 2:34 of regulation, the West Virginia Mountaineers blew past the No. 7/8 Jayhawks in the final seconds, 65-64, Saturday afternoon inside WVU Coliseum. West Virginia’s Jermaine Haley hit the go-ahead bucket with seven seconds remaining before two Jayhawk game-winning attempts on the other end fell short as KU suffered its second loss of the Big 12 season. 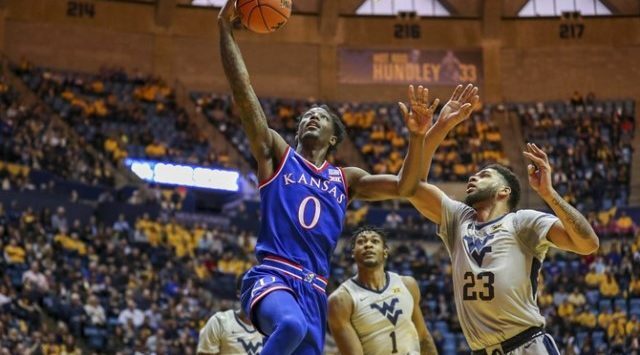 The loss dropped the Jayhawks’ record to 15-3 on the year and 4-2 in the league, while West Virginia snapped a five-game losing streak, moving to 9-9 in 2018-19 and to 1-5 in Big 12 play. With Kansas leading by six points and just over two minutes remaining, as it had done all game, West Virginia refused to go away. Wesley Harris connected on a 3-pointer at the 2:14 mark the cut the KU lead in half, 64-61, before a missed Marcus Garrett jumper on the other end quickly gave the home side the ball back with 1:51 to play. Derek Culver made it a one-point game just 25 seconds later when he sliced to the rim for a lay-up. For a moment it seemed as though Garrett made a game-saving play on the Jayhawks’ next trip down the court, stealing the ball after a missed lay-up to give his team a fresh possession with only 54 ticks left in the game. But a missed 3-pointer from Lagerald Vick put the ball in Haley’s hands, where he was able to convert on the other end on his lay-up with seven seconds to go in regulation. It marked WVU’s first lead since the 13:38 mark of the second half. The Jayhawks got two tries at a potential game-winner. Vick missed a 3-point attempt from the left wing but Dedric Lawson was able to bring down the offensive board. His desperation jumper as time expired didn’t go, however, as Kansas suffered a heartbreaking 65-64 loss. It was a back-and-forth affair over the opening 20 minutes and, while the Jayhawks were able to amass a 20-14 rebound advantage, they weren’t unable to put much distance between themselves and the Mountaineers. Thirteen first-half turnovers and a 37 percent shooting clip helped the home side stick with KU in the opening frame, which included 11 lead changes. A pair of Lawson free throws with 3:38 to play in the half gave KU a 21-16 advantage, but West Virginia responded with a 7-2 run to close the half and knot up the score at 23-23 as both teams headed to the intermission. After WVU came out of the locker room and pushed its lead to three points, 28-25, on James Bolden’s triple at the 18:45 mark, Kansas took control for much of the second half. On the Jayhawks’ ensuing possession, Dotson drilled his lone 3-pointer of the game and Kansas was off and running. Back-to-back threes from Quentin Grimes and Vick, along with a free throw from Lawson, handed the Jayhawks a five point lead, 39-34, less than five minutes after the restart. KU hit 11 of its first 14 tries from the field in the second half, but was never able to build a lead greater than two possessions for the rest of the contest. Lawson scored eight of the Jayhawks’ final 12 points and, with Garrett’s lay-up with 2:35 to play, KU held its largest lead of the day at 64-58. However, Garrett’s bucket would mark the final points for Kansas as the Mountaineers stormed past them in the final minutes to secure their first Big 12 victory of the season. Garrett and Lawson each finished with 15 points, with Lawson adding 11 rebounds to collect his 12th double-double of the season and Garrett posting a career-best six steals. Vick was the third Jayhawk to score in double figures, tallying 13 points in 33 minutes.